The Original P-3 Orion Engineering Prototype 30-bit Digital Computer, the Univac 1830, CP-823/U used in Project A-NEW Mod 3. Quantity built: 1. Circa 1965. 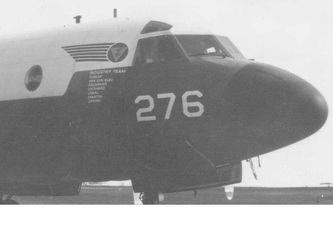 BuNo 148883 was the first P-3 built for the Navy. Originally stationed at Pax River, it became the test bed aircraft for the Naval Air Development Center and Project A-NEW Mod 3. BuNo 148276, YP-3A Naval Air Test Center prototype test aircraft. Project A-New MOD 1 and XN-1. ...Photo courtesy of Ron Handy. In 1963, the US Navy Dept., Bureau of Weapons, Naval Air Development Center contracted Univac Defense Systems Division of Sperry-Rand to perform a study of the feasibility of a central digital avionics computer for the Navy’s Project A-NEW, the ASW (Anti-Submarine Warfare) development for the Lockheed P-3 Orion. The idea was to develop and build the first central digital computing system able to coordinate the many sensors, MPD (Multipurpose Display) and tactical air command functions. The study, “Final Report on Avionics Unit Computer Study 10-21-63”, concluded that a miniature, modular, digital avionics computer could be engineered, built and tested using current developing technologies. Univac’s first attempt in early 1963, used a modified Titan II missile inertial guidance module, the ADD 1020 for the XN-1, A-NEW MOD1 system. (I have correctly identified the ADD 1020 as the Navy designated CP-754/A, using documents in my possession). The programming proved to be difficult and the ADD 1020 was deemed not a suitable computing system for the developing P-3 Orion ASW interface program. After a meeting in January 1964 with representatives from Univac and the Naval Air Development Center, contracts worth almost $2 million dollars were awarded to Univac Defense Systems Division to engineer, build and test the first digital 30-bit Airborne computer, the CP-823/U (Univac 1830) engineering prototype, for the A-NEW MOD3 test aircraft. This would be Univac’s first computer to use the monolithic flatpack integrated circuit, using a DTL (Diode-Transistor Logic) silicon chip. This technology was simultaneously being developed for use in the Univac 1824 for the Aerospace / missile guidance program; the Univac 1830 was completed first. The CP-823/U was also Univac's first computer to lay the electronics flat, on a Printed Circuit card, instead of on-end like the cordwood block electronics modules, (Burndy packs). 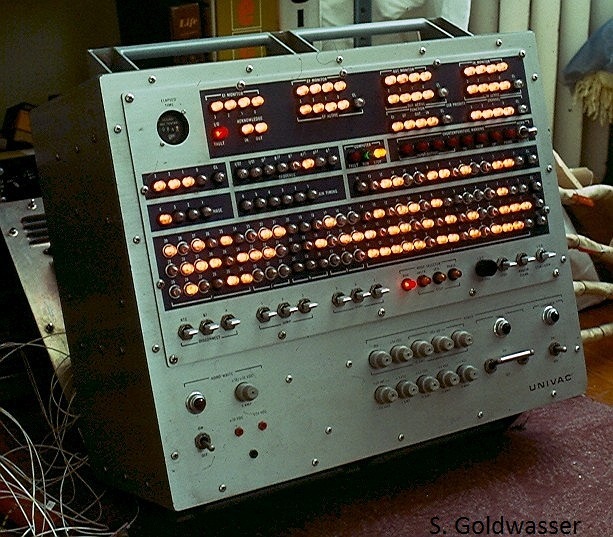 The CP-823/U Computing System, Serial A1, (Univac 1830), A-NEW MOD 3 was delivered to the Naval Air Development Center, Johnsville, Pa in 1965. The Computing System consisted of the: Control Console, Airborne Power Supply, Central Processor, 32k Memory, four Airborne I/O units, Ground I/O unit and the 90-pin cables and power cables. These computing system units were (assumed) mounted in-line in the aircraft on the case rails, so their specially designed cases could be connected to the airflow duct for cooling. All the units have easy access panels. The Control Console, sometimes referred to as a maintenance panel, contains some of the first 14-lead flatpack chips on Experimental PC cards. All of the indicator lights are push switches for single step programming. The combined Airborne Power Supply unit is layer upon layer of electronics to supply the multitude of currents to the system. Univac contracted the Oscar A. Schott Co. of Minnesota to build it to their specifications. The Processor and four Airborne I/O units together use hundreds of specially developed 90-pin PC cards, which contain up to 64, 10-lead monolithic flatpack IC's and resistor packs each. The 32k Memory unit weighs 120 pounds. 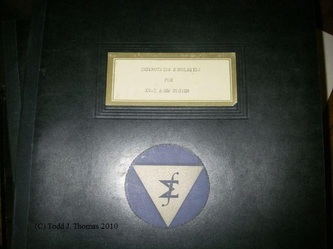 It contains seven 4096 word DRO (destructive read-out) core stacks and one 4096 word NDRO (non-destructive read-out) Thin Film Stack module, borrowed from the Univac 1824 missile guidance development program. The seven core stacks are surrounded by hundreds of cordwood block electronics modules. The Thin Film Write uses 10-lead flatpacks. The specially designed Ground I/O unit contains 279, 27-pin PC cards which contain discrete and Hybrid circuits, originally developed for the Univac (DOD designated) CP-667 computer. The CP-823/U (Univac 1830) prototype computer’s extensive testing, in and out of the aircraft, eventually led to the development of the CP-901 / ASQ-114, (Univac 1830A) in 1968. This was the designation of the production computer for the P-3C Orion which was housed in a single cabinet and used different PC cards. A Univac pre-production report stated: The Univac 1830A is a design evolution of the highly engineered and tested 1830 (CP-823/U) digital computer.